It’s Sunday again and unlike last week, we wake up to a bright blue sky. We have breakfast and are out of the house at the unusually early hour of 11 am – but we have a boat to catch. 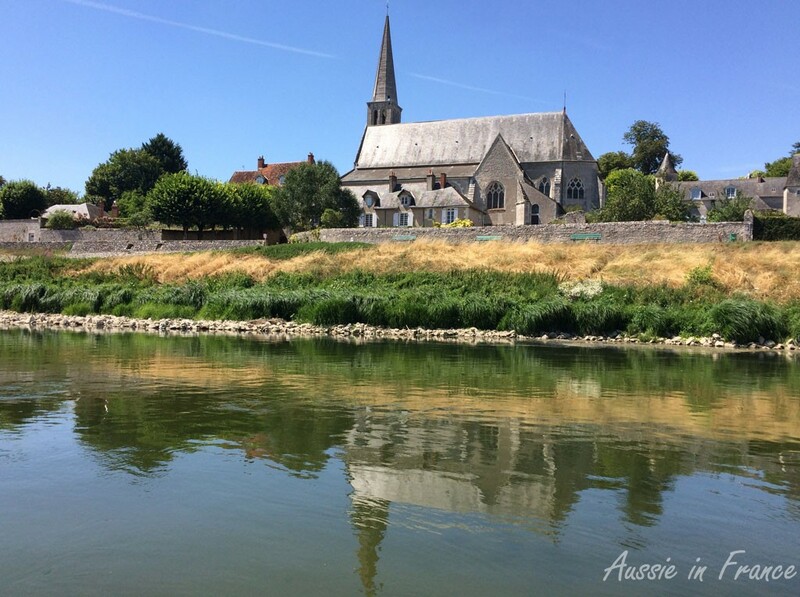 We drive to the other side of Blois and park next to the bike path that takes us to Cour-sur-Loire and is part of the Loire à Vélo route which in turn is part of the Eurovelo 6 itinerary from the Atlantic Coast to the Black Sea. 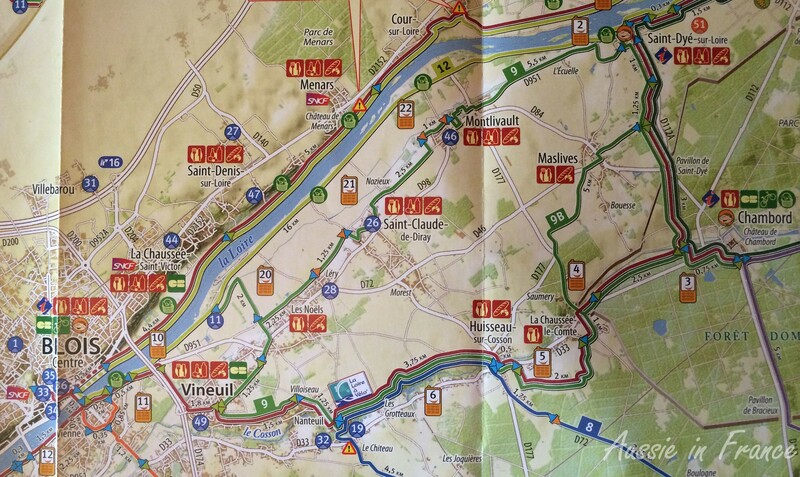 It is also on itinerary n° 12 on the Châteaux à Vélo map available from the local tourist office. This is a route we often take but today, there’s a difference. 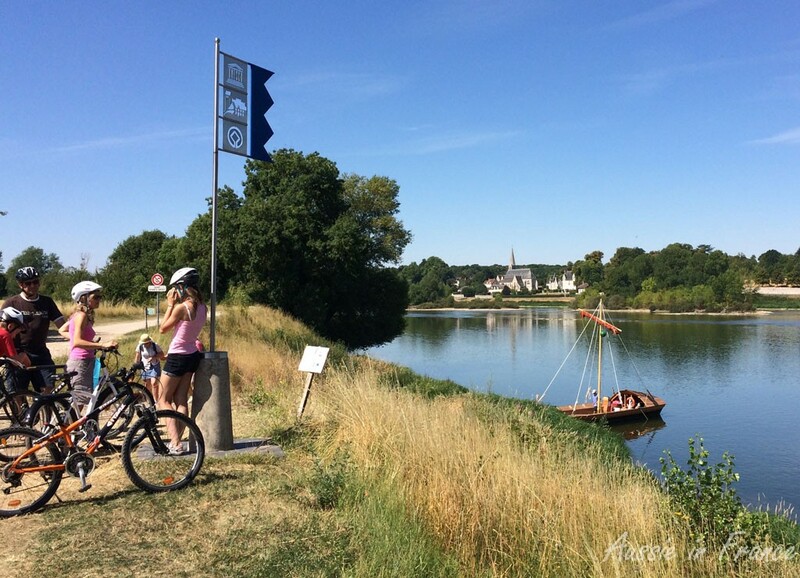 When we get to Cour, we’ll catch the new bike ferry across the river to join the bike path at Montlivault leading to Saint-Dyé-sur-Loire and from there to Château de Chambord. 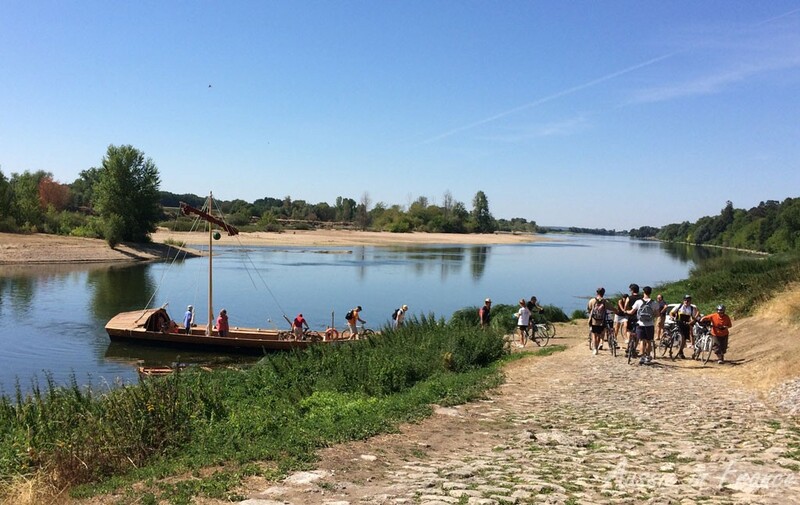 It is also part of itinerary n° 12 but you usually have to go as far as Muides to cross the Loire. The Châteaux à vélo map, showing itinerary n°12 (lime green), starting in Blois on the bottom left, just after the dotted line heading north-east. The ferry leaves about a centimetre north of the long arrow after Menars and arrives on the other side not far from Montlivault. The last ferry before lunch leaves at 12 noon. It takes us ¾ hour to cycle the 8 km to the ferry stop. As we approach Cour we can see the ferry halfway across the river. By the time we get to the ferry stop at n° 122 quai de la Loire, the passengers are disembarking. 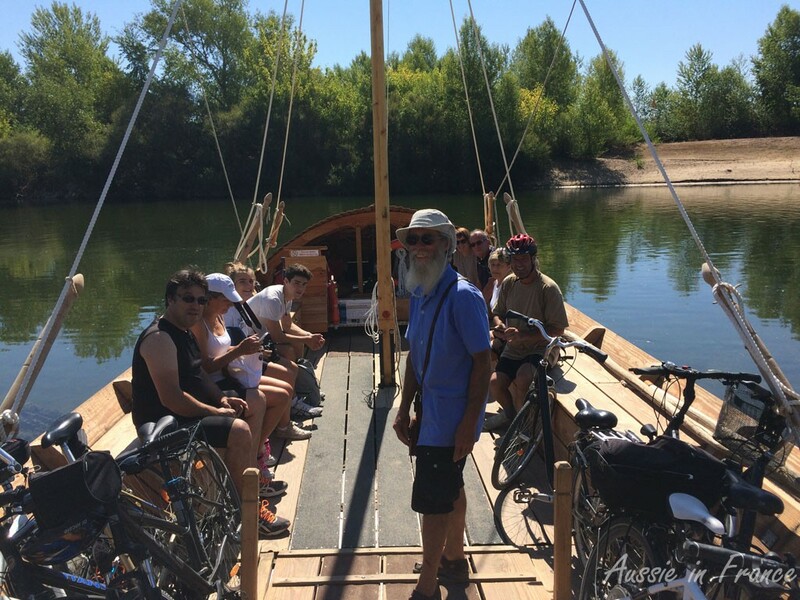 The flat-bottomed gabarre boat typical of the Loire region was designed in partnership with the Kaïros Association as part of a return-to-work project for long-term unemployed. It took six months to build. The service started on 21st July and will continue until September. Next year, it will run on weekends in June, then every day in July and August. The gabarre with its little boat used by the boatman to go ashore after anchoring the ferry in the middle of the river for the night. 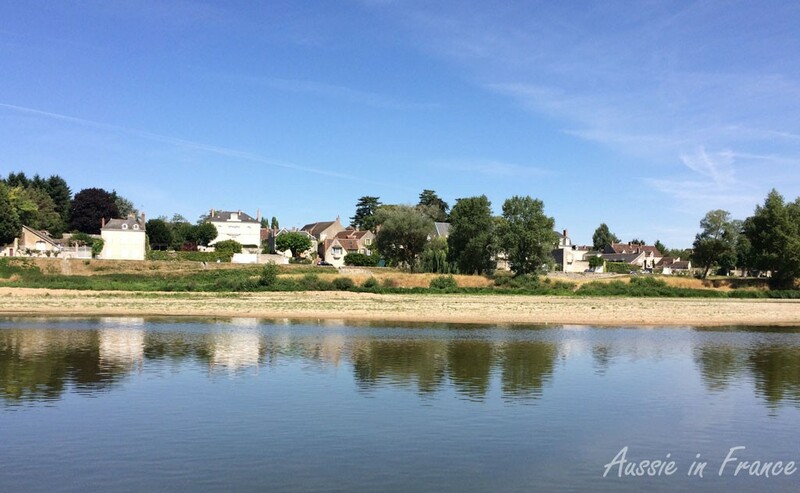 The ferries leave Cour-sur-Loire at 11 am, 12 noon, 2.30 pm, 3.30 pm, 4.30 pm and 5.30 pm and depart Montlivault at 11.30 am, 12.30 pm, 3 pm, 4 pm, 5 pm and 6 pm, every day except Monday which is reserved for groups. 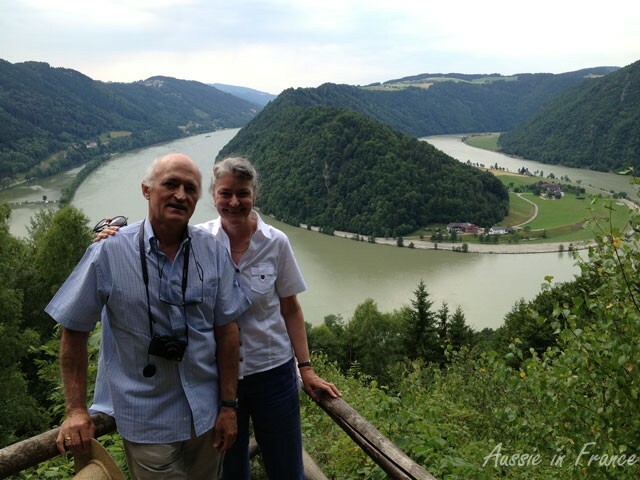 We have many wonderful memories of crossing the Danube, Moselle and Rhine Rivers in Germany and Austria during our cycling trips in 2013 and 2014, particularly the S-bend, so it feels as though we are on holidays. As the boat only holds 12 passengers and 10 bikes, I’m a little anxious about there being no room left, but we needn’t have worried. Apart from ourselves, there is a cycling couple from Mer, a family of four from Florence, also with bikes, two women with a small child and another couple on foot. Twelve adults and one child who is most put out when he discovers he has to wear a life jacket! Our boatman welcomes us on-board and we pay our 2 euros each. The Italian father is already in voluble conversation with the other passengers and the atmosphere is very jovial. It’s better than Germany and Austria in that respect because we can actually talk to the other people! Jean Michel sits just next to the boatman so he can ask lots of technical questions. 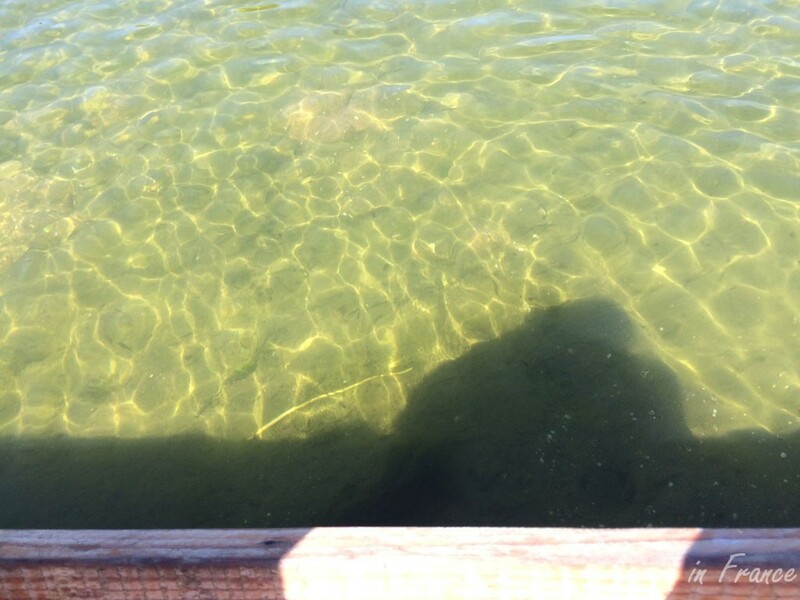 The boat has a draught of 25 cm, which is very fortunate as we can clearly see the bottom of the river at one point. The boat was made using traditional methods. The views as we take the short 15-minute trip across the river are stunning particularly as it’s such as beautiful day. 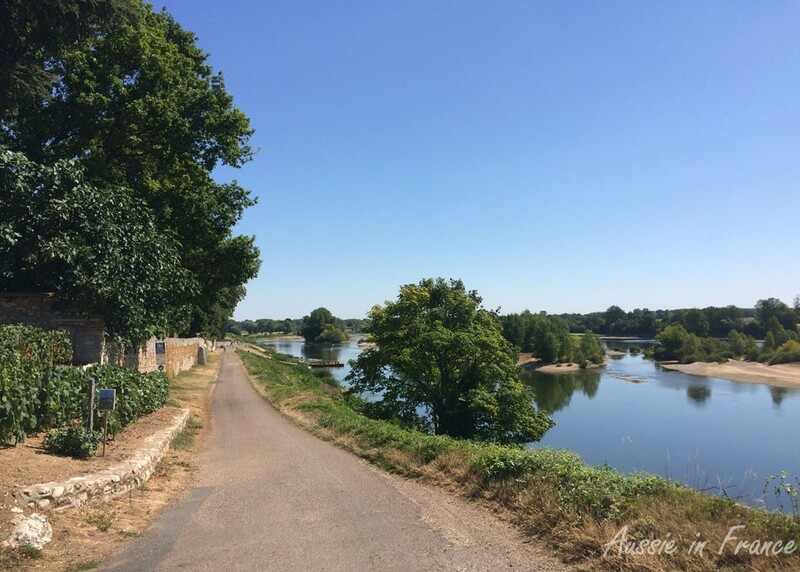 On the other side, we continue to Saint-Dye-sur-Loire and on to Chambord, 12 km away, noticing how different the vegetation is from the last time we were here a couple of months ago. The lack of rain has turned the green countryside an Australian brown. 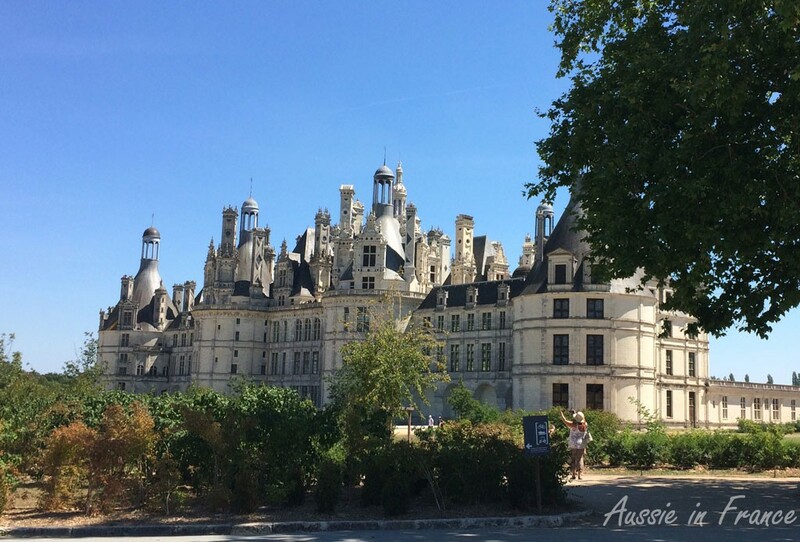 Chambord is its usual majestic self. We have a copious salad and cold drink of wine for lunch at Les Caves du Roy under the shade of the linden trees in full view of the château before cycling back to the ferry stop at Montlivault to catch the 3 pm ferry. This time, there is only one other cycling couple and a man from Belgium doing the Camino walk. His destination today is Blois. We’re in the boat waiting to leave when we see two young cyclists stop to read the information about the ferry. We call out to them to join us but they continue on their way. They don’t know what they’re missing! 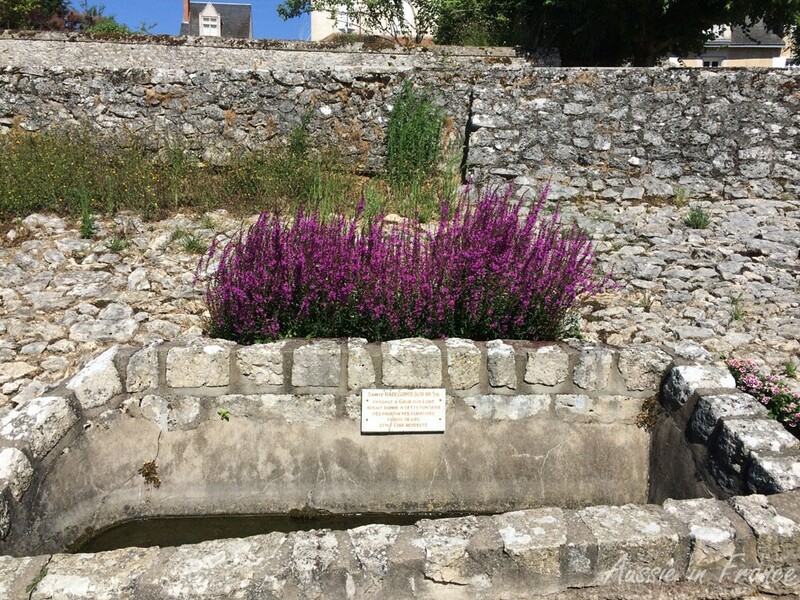 When we reach the other side, we stop to admire Saint Radegonde’s fountain. Her visit here in the 6th century is said to have given the fountain curative properties. The only thing missing is an ice-cream stand. Now what can we do about that? 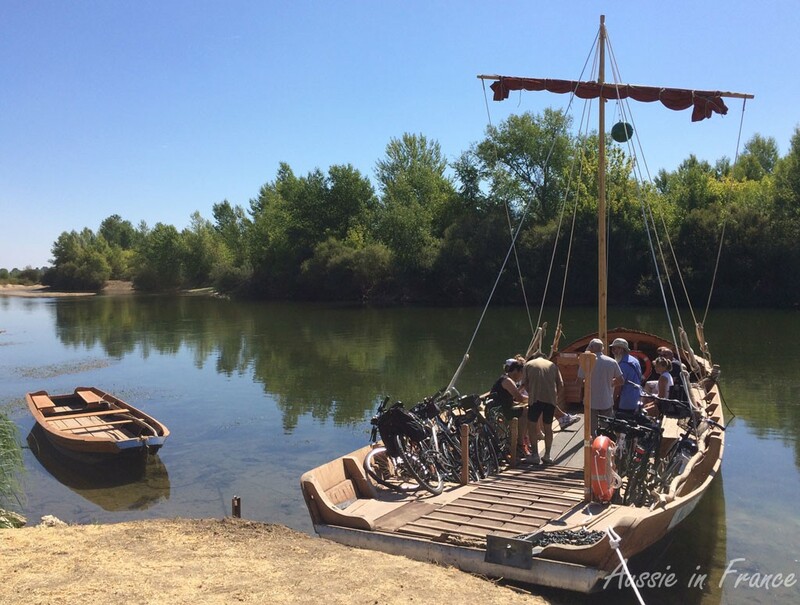 This entry was posted in Cycling, Loire Valley châteaux and tagged bike ferry cour-sur-loire, bike ferry montlivault, bike ferry over the Loire. Bookmark the permalink. Quite a pleasant way to cross the river, and Chambord looks magnificent! What a perfect day! What a great way to employ the unemployed. Just love this ferry. We loved it and thought it was a wonderful way to employ the unemployed as well. What a lovely day out. Thanks for sharing – looks stunning. We certainly enjoyed ourselves! Thank you. 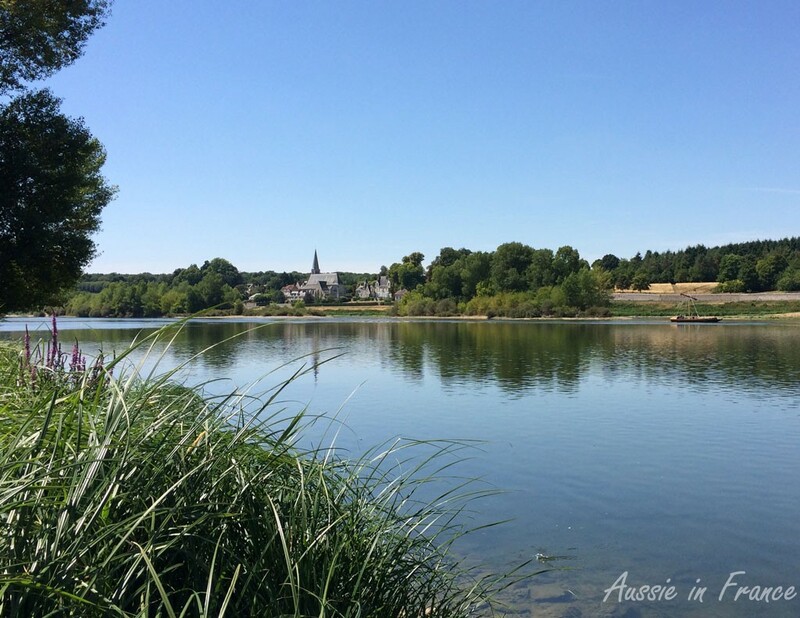 A friend suggested that I write a post on my favourite rides in the Loire so you might find that useful as well.